Amazing Race 21, "Off to See the Wizard"
One of the most exciting parts about The Amazing Race is how unpredictable events can completely change the game. Although teams are competing in designed challenges, there is no definite way to avoid chaos. There have been extreme cases in the past, especially in the All-Star season where the next leg began while others were still competing in the previous one. That may be the case again here because of several factors. First of all, a delayed flight strands Abbie and Ryan and Josh and Brent overnight in the Frankfurt airport. They finally arrive at Moscow while several others are finishing. 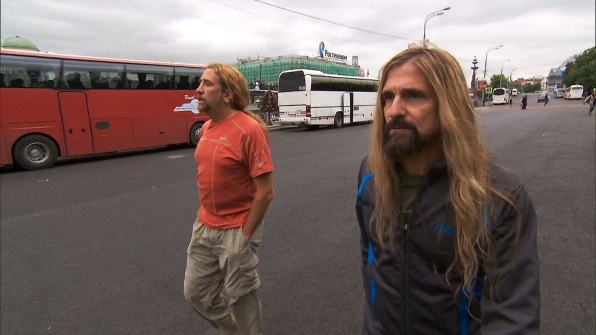 The other victims this week are James and Abba, who leave their bags in their taxi. When the cab driver drives away, they’re left without their belongings. This mistake is even worse because Abba’s passport is with their gear. Although they finish the leg, the rockers must retrieve their passports to continue. A stern Phil gives James and Abba the bad news and sends them scurrying for survival. The dreaded “To Be Continued” text appears on the screen with three teams left on the field. For more details, check out my full review at Sound on Sight. The Zurab Tsereteli Sculpture Park is a stunning place, and I wish they'd spent more time there. Named after a famous Russian sculptor, this collection of giant statues is amazing and would have been the perfect place for a challenge. Tasks requiring complex moves on this show are often easy because the judges don't require players to really follow the routine. The synchronized swimming did not follow that trend. Like the dancing task that wore out Mark last season, it's a serious challenge where even good swimmers may struggle. It's unclear why Natalie and Nadiya are so irritable this week. They struggle a bit with the swimming, but they spend the entire leg near the front of the pack. Maybe it was the bad meal they had at the food court. While they're still good TV, the twins' optimistic attitude has been waning in recent episodes. I wonder how much help production can offer to James and Abba with finding their passports. If they remember the cab company, it may not be too difficult. Still, locating a single cab in a city like Moscow could be difficult. My guess is that they'll survive and beat Josh and Brent, but it could go either way.